A brief stop in Calcutta, India, while serving Marianist communities in the region in 1997 gave the Rev. 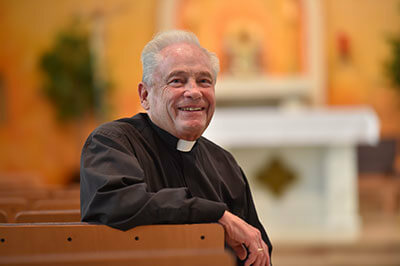 Jim Tobin, S.M., now the Greehey School of Business chaplain, the chance to experience the holiness of Mother Teresa in person — a memory he cherished as she was canonized Sept. 4. Tobin reached Calcutta in time for the Mass on the Feast of the Annunciation of the Blessed Virgin Mary and recalled entering the chapel at Mother Teresa’s Missionaries of Charity. The chapel was packed with nuns and Mother Teresa sat in a wheelchair in the rear of the space, just one among many sisters, said Tobin, who noted her humility and simplicity. 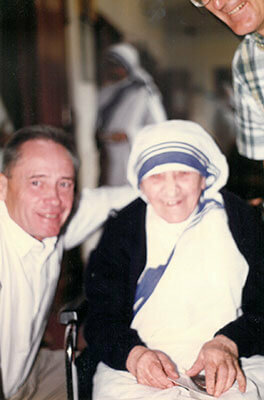 After Mass, Tobin and two other Marianists were invited to breakfast with Mother Teresa in her dining room. “She offered me a fried egg, a cup of tea and a piece of bread” and they had a delightful conversation, Tobin said. Tobin asked her to pray for his parish in St. Louis, and she agreed. Tobin has traveled to India four times in all, as recently as this year with a group of St. Mary’s University undergraduates pursuing an alternative spring break program. The group stayed with the Marianists in Bangalore and taught business development skills to high-school dropouts from the slums. During those trips and through his work of ministering to business students, Tobin embraces the lessons learned from his brief visit with the Saint. One lesson was the contemplative mode of being that Mother Teresa exhibited in his presence despite the frenetic surroundings. He continually channels that energy to refocus on what is truly important.